Why is humor so deeply appreciated? Laughter is one of the great joys of life. Joy is fundamental to who we are. Yogananda translated the classic definition of God given by Swami Shankarananda, “Sat-chid-ananda,” as, “Ever-existing, ever-conscious, ever-new joy.” Yogananda added the concept of “new” to the ancient definition. Yogananda explained that God became His creation, which means that all of life exists, is conscious, and has the quality of joy innately within it. This is why human beings universally seek happiness. It is our nature to be happy, and the search for happiness motivates everyone. A master is one who has united his consciousness with Satchidananda, and so you see in the masters profound joy. Some share this joy outwardly through their personalities; others may be more serious outwardly, but great joy sparkles in their eyes and is felt in their presence. Yogananda’s experience of life, his experience of the goal of all life, was filled with joy. He lived in joy always, and sought to awaken it in others. Though he could be intensely serious and deep as appropriate, he also could express the greatest joy, often in unexpected situations. The humor in this book arose spontaneously from Yogananda’s deep joy. Sometimes he used humor to express an important spiritual principle. Sometimes he used it in training the disciples, to help them learn in a way that reasoned lectures could never achieve. 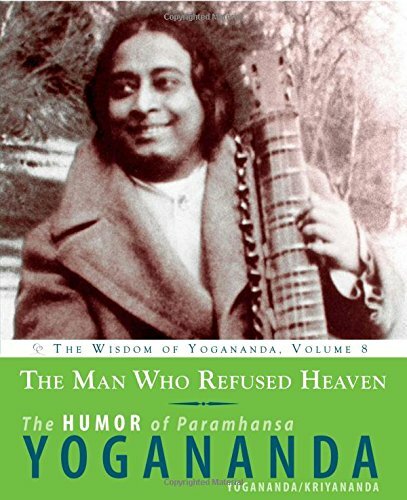 Most of the humor in this book was taken from Yogananda’s writings. Also included are experiences with the master that demonstrate his playful spirit. These were written by Swami Kriyananda, from his years of being trained personally by Yogananda, or from stories that were shared with him by other close disciples. The message of this book is both playful and serious. The serious message is that joy can be found within us always. We should look for it there and share it with others.